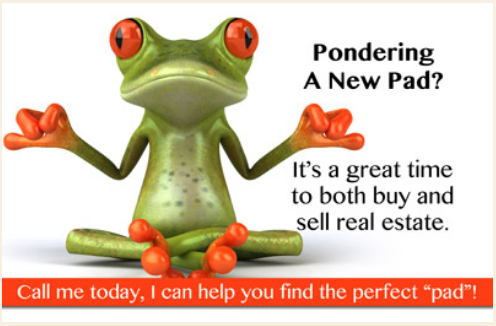 Real estate farming postcards create name recognition for you in your farm area, which helps return new client leads. While there are many different types of real estate farming postcards, this article will show the best ideas and offer designs and templates you can follow to maximize your results in your neighborhood. The top real estate farming postcards are customized, reflecting both your personal brand and your own unique way of connecting with the community through the work that you do. To highly customize and brand your postcards, we recommend ProspectsPlus. 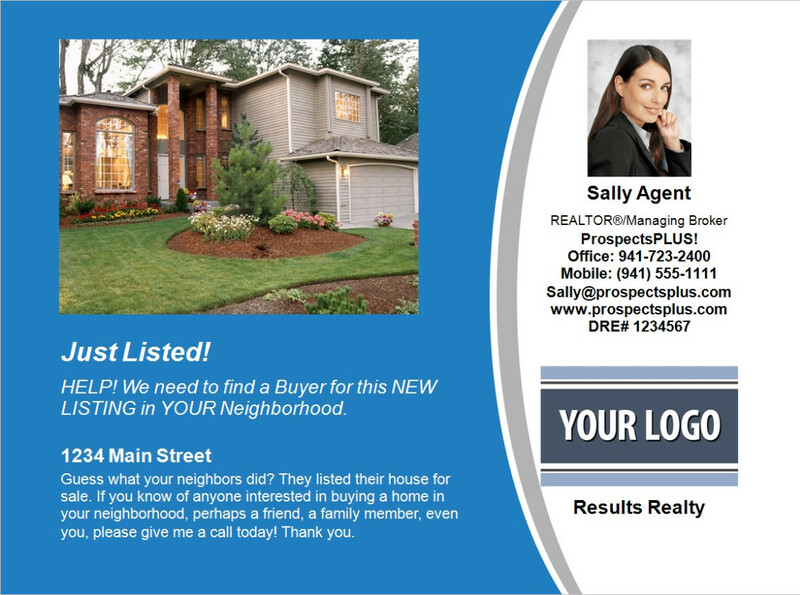 ProspectsPlus offers an array of specialty real estate postcard templates for you to customize, and even a mailing service to make it easy. Here are the top 25 real estate farming postcard examples and templates. 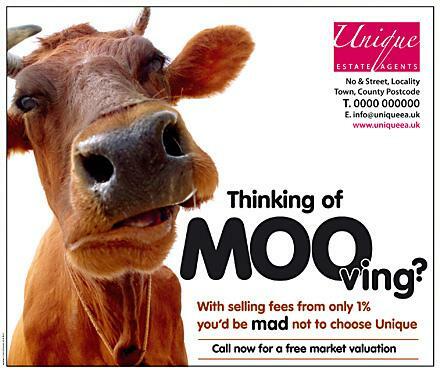 Keeping your farm area current on the latest sold and listed properties is one way to grab their attention. Everyone wants to see what the house on their block sold for, or what the property is listed for around the corner. 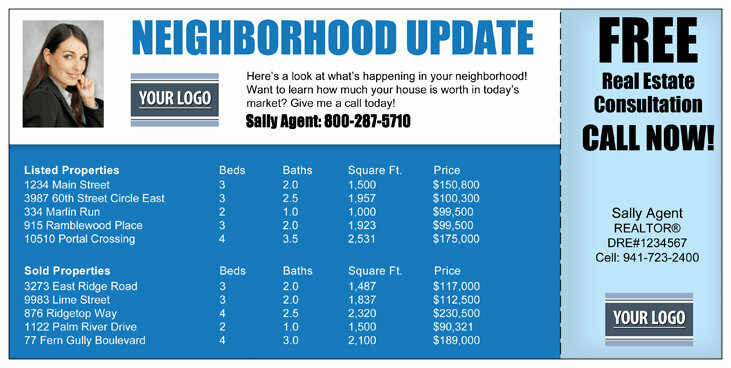 Offering neighborhood updates is a great way to gather interest and slide in your own contact information. This is a customizable template you can use from ProspectsPlus, and you can opt for either the regular or oversized version (shown above) in your mailings to bring in new client leads. Creating curiosity is a wonderful way to open the door to homeowner investigation without coming across as pushy or overly pitchy. While the agent information is located on the back of this card, the image in front feels friendly and welcoming. Nobody likes a high-pressure selling situation, whether postcards or cold calls. If cold calling still makes you nervous and you need a new approach, we have a guide to cold calling that will take you through the steps and put you at ease. Understanding the questions that might be on the minds of those in your farm area can be a useful tool in developing your own postcards. When designing your own real estate farming postcards, keep in mind some or all of the questions your potential clients might have, and make a design that encourages them to inquire further. If you are still searching for some answers on how to map out your farm area, check out our guide to how to choose and dominate a farm area. 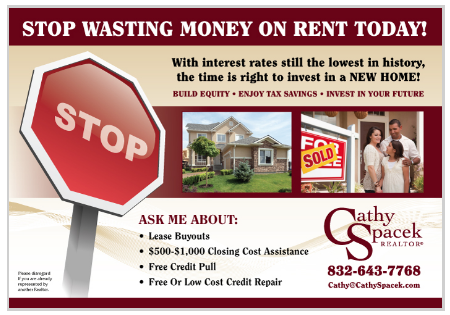 People who are renting often feel like they are simply throwing their money away. By hitting this pain point, and offering some assistance, your postcard might be the motivating factor that inspires a first-time homebuyer to give you a call. Rentals can provide you with wonderful leads, but also a solid supplement to your income if you own them. If you’ve ever considered buying your first rental property, we offer an article on buying a multifamily property in six steps. We've got the best designs and templates you can follow to maximize your results in your neighborhood. 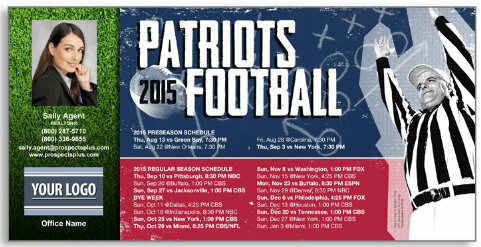 If there is one thing some households will tack on their refrigerator, it’s the sports schedule of the local team. 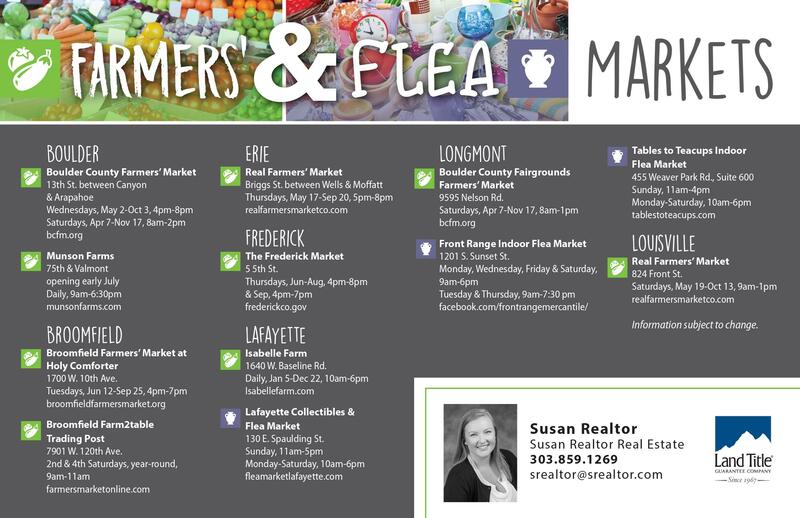 If your farm area are big fans of football, hockey, soccer, or even the local minor league baseball team, creating a custom schedule for them might keep your photo tacked up all season long. 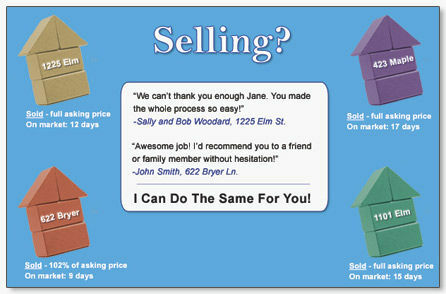 This real estate farming postcard template is the product of ProspectsPlus. It’s easy to go onto their platform, add your photo, the local team schedule, and have your card be in households for months. 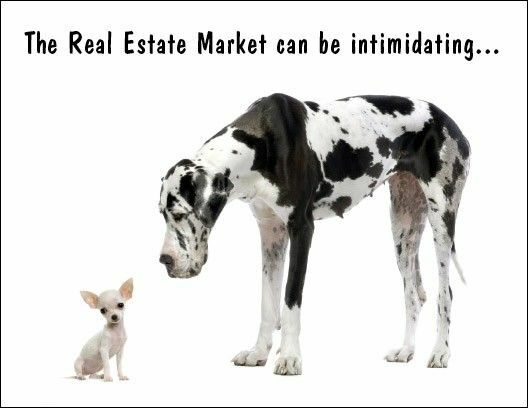 Seeing that an agent, team, or brokerage is selling a high volume of homes in your neighborhood establishes instant authority. Homeowners see this type of volume as social proof that you are an obvious choice. If you want homeowners in the area to see you as the authority on home sales in your farm area, don’t hesitate to show them what you’ve been doing. 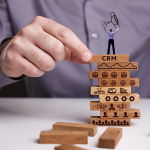 If you’re looking for more ways to reach new leads, here are 52 creative real estate marketing ideas and strategies. Putting people in a light-hearted mood can make them more likely to pick up the phone. This postcard is visually far different than anything they’ve likely received before, and likely gets a homeowner’s attention. The agent who sends this card will likely be perceived as someone they can enjoy working with, and who will understand the importance of keeping the selling process as stress-free as possible. Here are the 15 best ways to get even more seller leads. This postcard uses testimonials to good effect, because it not only gives wonderful remarks but the street address of the individuals who state them. Real estate farming postcards that feature testimonials can be effective, especially if they are people already known by the neighborhood residents who live nearby. If you can find a way to include testimonials from local individuals when mulling over your next real estate farming postcard ideas, you may get more leads than you think. Another effective use of testimonials comes through video. If you’ve been thinking about how to include video in your marketing strategy, here are the four real estate videos every agent needs to master. Using color and an image that catches the eye makes your postcard more likely to stand out, and makes it more likely that potential clients will read your message. While many agents understandably gravitate toward more subdued and sleek colors for branding, having something eye-catching often grabs attention and gets your services noticed. To read more about selecting colors that represent your brand and the psychology of colors, check out our article on brand identity design. Real estate farming postcards that make a solid introduction can be one of the most important you send. People often do not know the agents in their area, so putting yourself out there and creating a personal connection can be important. 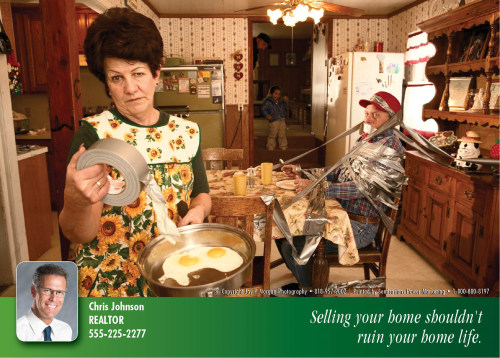 When customizing your real estate farming postcards, be sure to have an image that seems friendly yet professional. If you still haven’t had a formal headshot or images taken, be sure to do your homework before making the investment. Here are our 25 ideas and tips for the perfect realtor headshot. By creating urgency in your message, you make those in your farm area more likely to reach out. Give people a reason to respond to your postcard. Always be thinking about how your real estate farming postcards make someone react, and be sure that there is ample suggestion to pick up the phone. If you are not always getting the seller leads you’re looking for, and seeking ways to expand your income in real estate, check out our article on 35 ways to make money in real estate for more ideas. 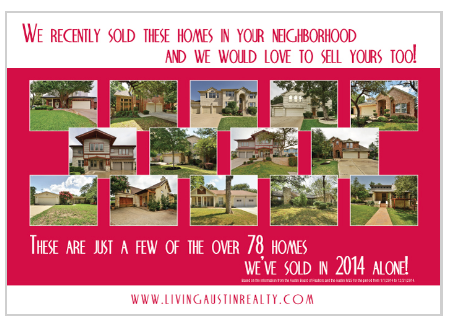 If you have a hot new listing, distributing these postcards might bring you some buyer and seller leads. 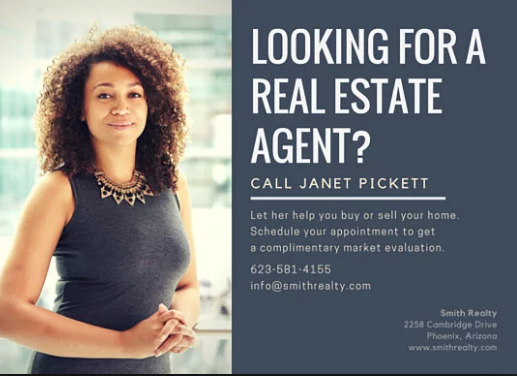 While the obvious play is to get some new leads for those looking for homes in the area, sellers who see the homes you represent on these real estate farming postcards may just contact you as well because they were thinking of selling their home too. This fully customizable template is available from ProspectsPlus. 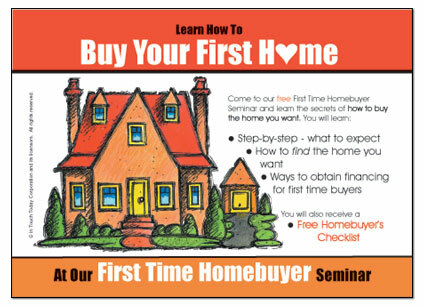 Hosting a workshop for first-time homebuyers is a wonderful way to showcase your expertise, build rapport, and genuinely do a good for the community. Buy pizza, bring soda, and consider it some of the least expensive advertising you’ll get. If you can truly help individuals understand the process, set aside fears, and demystify homebuying, you can often gain a number of new clients. If you’d like to brush up on the special considerations of business owners purchasing homes, we offer the top 15 home buying tips for business owners. What we love about this postcard is that it gets your attention, then gives you an immediate value proposition. Selling fees from only 1 percent! 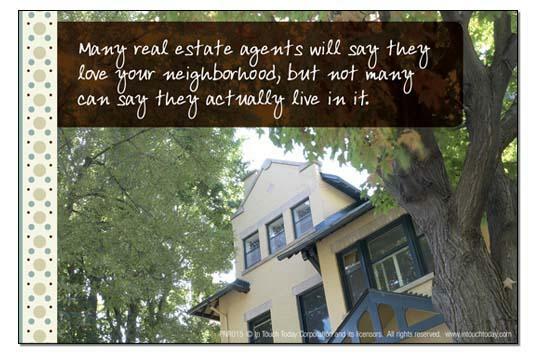 Anyone who has ever sold a home will sit up and pay attention to that. In your real estate farming postcard ideas, getting their attention with images and using color is important, but be sure to have a proposition to hand them quickly or your postcards will end up in the trash. This real estate farming postcard does its job by relieving seller fears and making the process look easy. 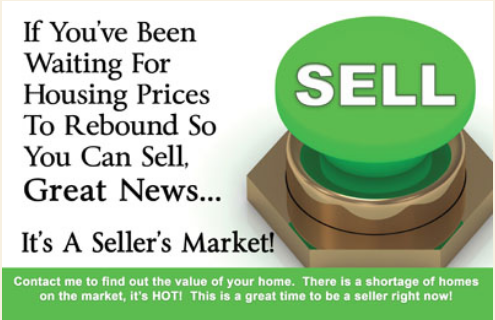 A seller’s worst nightmare is putting their home on the market only to have it languish. By showcasing that you have buyers ready to purchase, individuals who may have been waiting for an upturn in the market have a reason to at least contact you to explore their options. Even better, you may get both sides of the transaction. The increased likelihood of getting both sides of the transaction is the same reason many agents use Zillow Premier Agent. By allowing you to be the exclusive agent shown on your listings on Zillow, potential buyers often reach out and contact you directly on your listings. 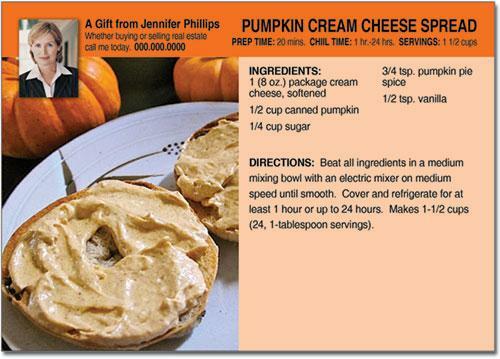 Delicious and timely recipes get attention and have staying power. If I received this in the fall season, it would be tacked on my refrigerator. Is there a delicious and timely recipe you could share from your family favorites? Using a template like this one to share your seasonal favorites could go a long way in keeping your name posted up in the local neighborhood home. One thing that might bring you even more recognition and keep a cohesive brand through your postcards, signs, and business cards is being sure to have a logo that people recognize. If you’ve thought about creating a logo, but weren’t sure where to start, here are the top 33 inspiring real estate logos and how to create your own. Real estate farming postcards that celebrate the holidays show thoughtfulness and give you a wonderfully warm introduction. 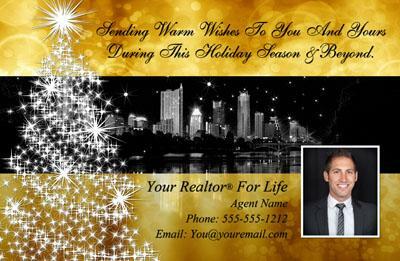 This holiday postcard stood out because it not only gave a lovely message, but stated what the agent did in a non-pitchy but obvious way. Receiving a nice holiday message as well as seeing your clear commitment to clients is a great way to give your business name recognition. 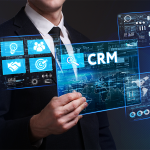 Another way to connect with former clients, wish holiday cheer, and build relationships with new potential clients is through an email newsletter. Here are some tips on real estate email marketing that can further extend your reach. If you’ve had some impressive local numbers or sales statistics, be sure to wow the neighbors in your real estate farming postcards. 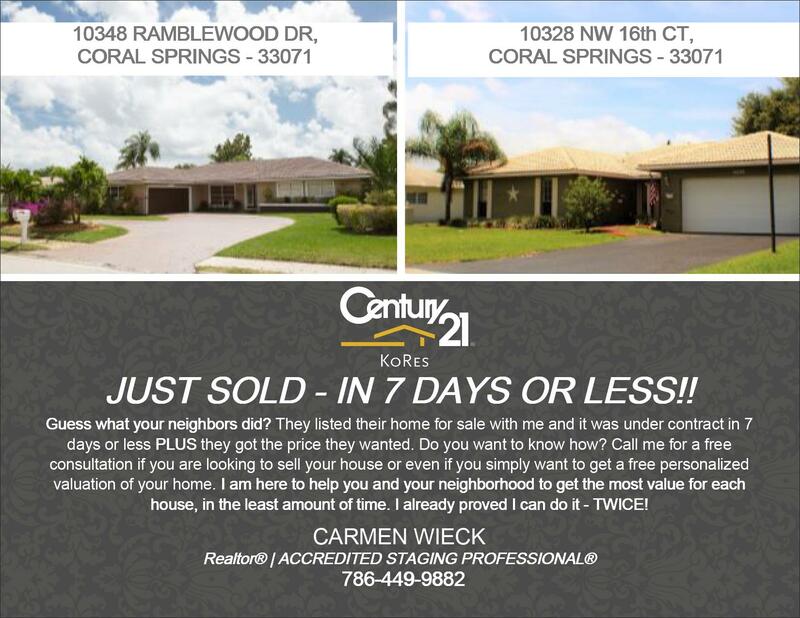 An agent who sold two neighborhood homes in less than seven days at a solid price, such as the postcard above, is a dream to most home sellers. Listing the addresses and images of the homes was also wise, so that surrounding properties know exactly which homes they are referring to. Selling a home under a week can be lucky for one house, but it likely isn’t for two. Impress surrounding homeowners and get some new leads. This postcard was created with a template from ProspectsPlus. Notice that you can customize the design to reflect local images, addresses, text, and more. Looking at the numbers shows immediate benefit to home ownership in a way that isn’t overtly selling. This postcard may be used by a financial institution in the photo, but it would also have fantastic use for any real estate agent. The best thing about real estate farming postcards like this is that they appeal to those unmoved by traditional pitches, and can be specifically sent to buildings with high rental populations, making them an incredibly targeted message. 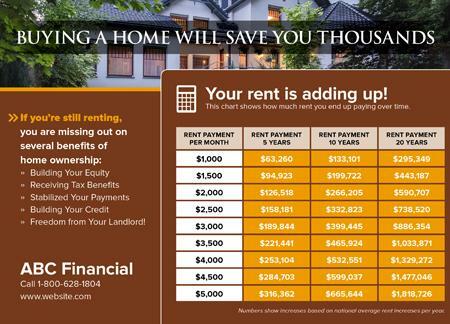 As the numbers show, there is benefit to own rather than rent in almost every situation. If you are currently leasing your real estate office, and considering whether or not to own, here are the top 25 reasons why businesses should buy instead of rent. Real estate farming postcards like this appear to be a true invitation. The benefits of using an open house postcard like this one is that it is more likely to get noticed in the sea of mail people receive, and feels inherently more welcoming than a standard real estate postcard with your photo on it. Novel approaches to open houses in the neighborhood often gather more interest because people don’t feel as though they are being sold to. 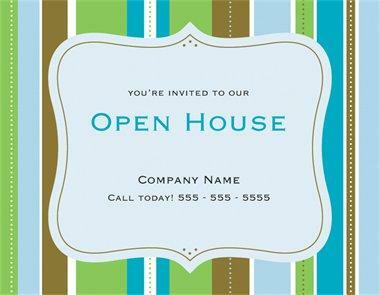 This real estate postcard template can be found at VistaPrint with an array of other customizable open house templates. 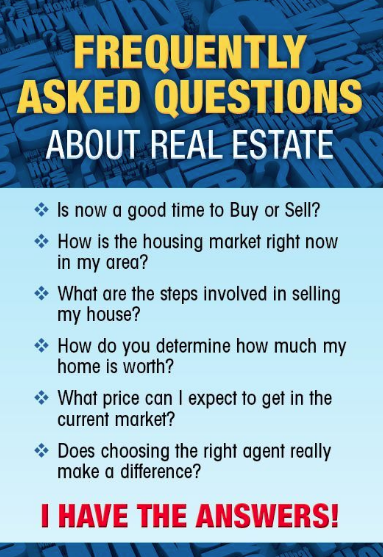 Showing local knowledge as a Realtor is important, but demonstrating it in this way can connect you with potential clients who will likely keep this card. If you have a farm area that extends through a number of communities, this is a fantastic postcard that anyone would be delighted to receive. Having an events reminder is useful, and your name and image on the front keeps you top of mind. If you send real estate farming postcards like this one, be sure to also reference your blog or social media channels. Talking about the neighborhood on your blog is another way to keep potential customers engaged, and further direct them to your social media channels. Here are the top real estate blogs around the web that we’ve seen. Everyone understands that no one knows a place like the person who actually lives there, and there is power in that. 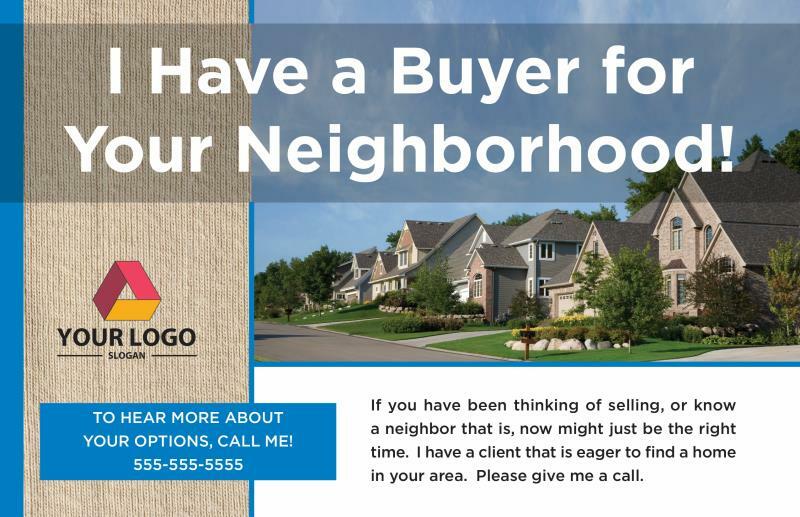 Living in the neighborhood you sell is a fantastic marketing angle, and a great way to connect with potential customers. If your neighborhood has turned into a hot market, another strategy that often works for local agents is door knocking. While it can seem intimidating, agents who live in the neighborhood they work often have far better luck than outsiders, and it’s absolutely free. 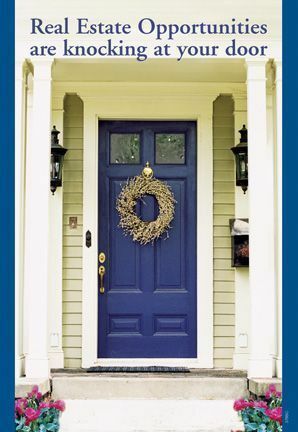 Here are our top 16 door-knocking tips. Giving something away for free is always a good idea. 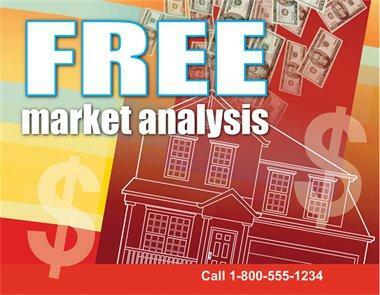 With this template, you can use a number of ideas for homeowners aside from the free market analysis. Real estate farming postcard ideas could be offering a free workshop to first-time homebuyers or a local seminar on how to get your home ready for sale (and get maximum price). There is a lot of opportunity if you can get individuals in the door, and offering something for free is often a way to do just that. This customizable template is available through VistaPrint. Broaching the subject of homebuying or selling can be a stressful topic for many people, so incorporating the use of pets can be a great icebreaker. Pets can make people smile, and gives a non-intimidating entry to someone’s consideration. While not everyone owns a pet, most people love kitten, puppy, and other pet photos on the internet because they make them laugh and feel good. While this specific real estate farming postcard is usually directed toward for sale by owner (FSBO) properties, sharing your knowledge about what makes homes sell quickly is often valued by anyone who has even considered selling in the near future. Great items to include would be renovations that add the most value, hot items to include in outdoor spaces right now, and other tips you might have from your local market. This template comes from ProspectsPlus and can be customized to your specific phrasing, needs, images, and market. There are so many real estate farming postcard ideas to choose from, and the best will reflect your individual brand and the impression you wish to leave in your farm area. While we show you 25 postcard examples and templates to inspire you, feel free to use it as a way to customize and showcase your own personal style. 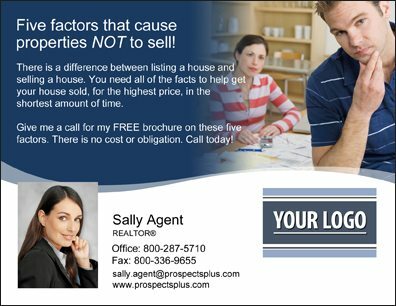 If you’re in the market for postcards, choose a company that specializes in real estate farming postcards, like ProspectsPlus. You can customize a variety of templates and have your postcards delivered in three to five days for 59 cents or less.